Water spinach has many names but is most commonly called Kang Kong. It is a ubiquitous vegetable in Southeast Asia. It grows easily and quickly and is packed with important vitamins and minerals which is why it is such an important vegetable in Southeast Asia. 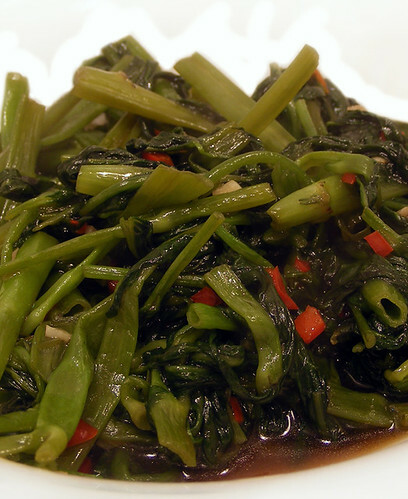 Water spinach is commonly mixed up with chinese spinach. It is quite easy to spot water spinach. It has elongated arrow-like leaves and hollow stems. If the stems aren’t hollow, it isn’t water spinach. Here is a picture of a version cooked by FotoosVanRobin. Fermented tofu is commonly served as a side dish for plain white rice congee. It can also be used as an ingredient to flavour vegetable dishes. There are basically 2 types: red and white although there can be some variations depending on the ingredients added during the fermenting process. The white one typically has a milder flavour. Add the water spinach and seasonings and stir fry quickly until well combined. I would do a taste test first before adding the soy sauce. Depending on the saltiness of the fermented tofu used, it could already be sufficiently salty without the soy sauce. Brussel sprouts recipes or brussels sprouts recipes?